Why remove my wisdom teeth? They’re not bothering me! It’s a fair objection. If a body part is not symptomatic, why remove it? After all, I would have objected if a surgeon had wanted to take remove my appendix prophylactically, before I developed appendicitis. Why should wisdom teeth be any different? Why should third molars (wisdom teeth) be removed before symptoms occur? It is because in most cases, the damage from wisdom teeth occurs gradually, with no symptoms until very late. But it nearly always occurs- either damage from gum disease, bone cysts or from cavities on the back of 2nd molars. The gums around the wisdom teeth are usually not the type most resistant to gum disease. Added to this is the fact that the wisdom teeth usually erupt in the corner of the jaw, allowing gums to partially cover them. These two factors predisposes patients to have gum disease around wisdom teeth. Now we would not worry if wisdom teeth lost bone and ligament support around them until they got loose and fell out. The problem is that if wisdom teeth are left in, periodontal destruction almost always occurs between the wisdom teeth and 2nd molars in front of them. When the wisdom teeth are finally lost, the second molars are often weakened due to ligament and bone loss. Often, when patients maintain their wisdom teeth over many years, they end up losing both the wisdom teeth AND the 2nd molars due to gum disease. 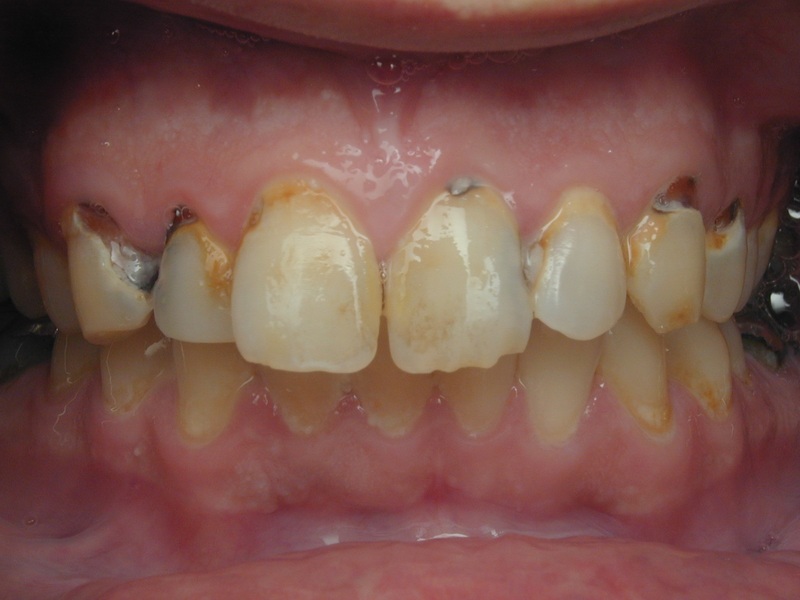 This patient developed decay on the back of his 2nd molar (black spot on the right of the middle tooth) because of his wisdom tooth (on the right.) By the time he realized it, the decay had infected the nerve. 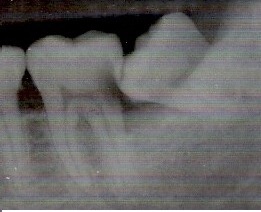 This meant a root canal, buildup filling, and crown were necessary on the 2nd molar in order to save it. Most patients have trouble cleaning between the rest of their teeth with floss. How much more difficult it is to clean around wisdom teeth! Honestly, I have met few patients who can do it well. Should unerupted wisdom teeth also be removed? A third, rarer reason to remove wisdom teeth is to prevent cysts and tumors in the bone. Around each unerupted wisdom tooth is a sac of cells which formed the tooth, call the dental follicle. Especially in the lower jaw, these cells sometimes expand, forming a tumor which can destroy a big part of the lower jaw. The presence of an impacted wisdom tooth may also weaken the jaw structurally. Sometimes I have seen accident victims in which the jaw broke at the location of an impacted wisdom tooth. Had the space been filled with sturdy bone, the jaw fracture might not have happened. Just because a wisdom tooth is unerupted, does not mean it will stay that way. Wisdom teeth can sometimes erupt and cause inconvenient problems later in life- even if a patient has complete dentures! Are there any situations where you might leave wisdom teeth in the mouth? When patients have four premolars removed for orthodontics, all molars are positioned farther forward in the mouth. Occasionally, there is enough room for the third molars to erupt and be maintained in good health. Another instance is when 1st or 2nd molars are lost. Occasionally, the wisdom teeth may be moved by orthodontics to be good substitutes for the lost teeth. But it is a very difficult movement, except in young patients. When patients lose their first and second molars, wisdom teeth can be used to anchor a removable partial denture, especially on the lower arch. Wisdom teeth are often not shaped very well for this use, but it can be better than resting the partial denture on gums alone. In elderly individuals, especially those on drugs to prevent osteoporosis, I might leave wisdom teeth alone, whether unerupted or not. Sometimes the surgical risk outweighs the benefits of extraction in older patients. If they are so useless, why do humans still have 3rd molars? The trend has been toward shorter jaws in mankind. The higher apes have plenty of room for 3rd molars, and some even have 4th molars as well. Through the years, man’s jaws have become shorter, but the size of his teeth has stayed the same. The result is not enough room for the wisdom teeth, which are the last to erupt in the mouth.